Is the Record/Script/Play method of automated testing ready to take its final bow? What will the next generation hold? Linda Hayes reflects on the past changes in automation, inspects the current situation, and offers her vision of the future. In January, StickyMinds.com introduced a new eNewsletter that covers tools and automation for the software development lifecycle. In this month’s Tool Look column, the editors of Better Software magazine and StickyMinds.com present a sample of what you can read each month in the Sticky ToolLook. Check your iterations at the door—it’s time for Waterfall 2006. With a wink and a finger pointed squarely at the April 1 square on his calendar, Mike Cohn offers some hints about what to look for at the much anticipated Waterfall 2006 conference. Have misplaced priorities or a lack of focus allowed your development project to run wild? Don't let a stampede of defects, repairs, and requirements change drive your project. Follow Robert Galen's advice, and corral that development with release criteria. Automated code analysis tools are becoming more powerful and more necessary than ever before. Alberto Savoia takes a look at the evolution of static and dynamic code analysis tools, from their humble beginnings to their present status as indispensable technology, and tells us what he predicts for the future. Poor software design will slow down even the most well-meaning code. Code smells are one element of poor design to watch out for in your projects. 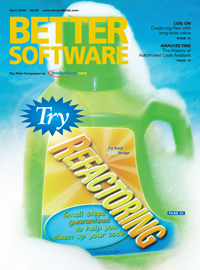 C. Keith Ray explains how you can start washing away your code smells with a dose of code refactoring. Where in the World?—Is Your Test Strategy Multicultural? Good software travels far and wide, and for rapid testers that means one of their goals is to discover risks associated with the product's operating differently with respect to some distinct locale. That's why Michael Bolton says "localizability" is preferred "internationalization," because the new target market may not be in a different country at all. If someone on your project team isn't working up to par, it might take more than a simple showing of your disapproval to put him on the right track. Johanna Rothman suggests trying specific and useful feedback--show your employees the light before you show them the door. A good log file may be the best tool to track down those "cannot reproduce" bugs, but creating the best log takes a certain amount of careful nurturing. In this article, Tod Golding explains why log files can be worth every extra line of code.